I needed to clean up a few things to conform to the requirements to the new store, as well as handle the transition from an abandoned plugin. As a result, this upgrade is not directly compatible with devices created prior to v2.0.0. Version 2.0.2 adds recovery features in the event of a communications break between Indigo and the Elk panel. Last edited by billchurch on Tue Dec 26, 2017 11:53 am, edited 1 time in total. So does this mean that the plugin can now communicate over the secure port on the M1EXP? (Last I remember, the old one didn't... and if you updated firmware on the M1EXP, you lost the ability to use the NON-secure port... and so I was definitely not updating firmware). Of course, I should probably check if this is the Elk plugin I was using (there were two floating around at one point, and both effectively had development discontinued). No support for the "secure port". 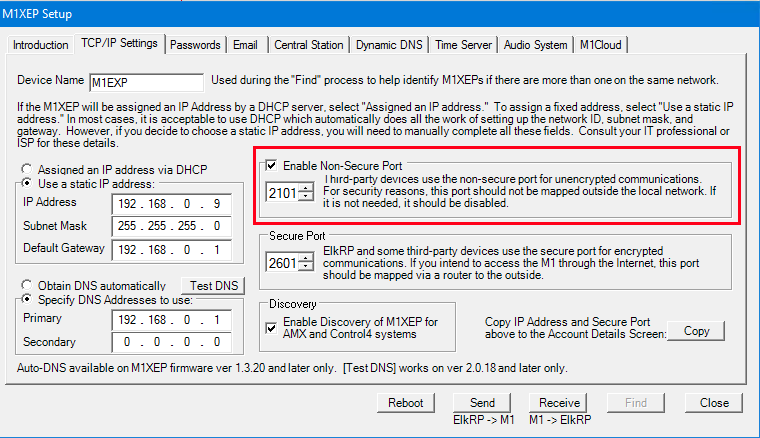 However I have updated to the most recent M1-XEP firmware and it does indeed let you enable the non-secure port. You just need to tell it to do that. Maybe previous versions had a but, I can't say for certain. I've always had non-secure capability. That being said, I certainly want to get the secure port working. It should just be a matter of layering in TLS, I just need to see how to do that with Python. self.runstartup was mentioned throughout the plugin previously, which did not exist, corrected to self.startup. Added start of communications error recovery. Plugin will now attempt to restart itself in the event of timeouts or loss of communication to the M1-EXP. Thanks for adopting this plugin! Let me know if you have any issues or any features you need. I have secure port on the horizon, will work on that at some point. Have you seen this error message in Indigo 7.2? I'm seeing the same error that Bollar is getting. I've just removed the previous version and installed the latest version of this plugin. I'm running 7.2. UPDATE: Figured it out. I needed to check the "Create Alarm Panel device" on the Configuration page and provide the panel's IP address and port number. All of the devices then showed up. New to Indigo and I am setting it up with the Elk M1G. When I send an arm alarm action using one of the server commands, the system is armed but the status of the alarm panel does not change on the first click of the button. Clicking the same "arm button" a second time sends a disarm command to the system but then the status of the alarm panel changes to arm_stay, etc. Two things are apparent: the arming buttons work like toggle switches - arming and disarming with each click; second, the status of the alarm panel only changes on the second clicks. Please let me know if this is normal and any potential solutions. At this time I do not have a reliable real time communication between the panel and the Indigo Touch for the arm/disarm functions. On the other hand, there is real time communication when the sensors are opened and closed. Thank you for your help. With the help of Elk tech support was finally able to sync the Elk alarm system with the Indigo server. The "armed state" of the Elk system is now accurately reflected in the Indigo Alarm Panel. The solution was actually quite simple with this note from Elk support: "In ElkRP under Globals, G29 – G42 (Special) make sure all six “Serial Port 0 Transmit Options” are enabled and sent to the M1." I now have real time communication with the system and can observe violated zones and the armed status. Exactly what I was looking for and with the capability to fully customize my control page(s). Thanks for taking over this plugin! Do you have any plans to implement additional Elk M1 features such as lighting control, output control, task activation, speech (from the Elk speakers), setting counters/custom values, etc. ?